Not all purchases work out. Things don’t fit, they arrive broken and sometimes the wrong product arrives. That’s a reality of retail. These aren’t issues unique to the online channel by any stretch, however the way in which returns are managed is, by its nature, a very different beast for online businesses. The inflexibility of traditional online retailers forcing customers to ship products back to companies is always going to end in a bad customer experience. It’s expensive, it’s inconvenient and it takes a whole lot longer to get the product you actually want. Returns doesn't have to be a pain point. In fact, 82% of consumers say they are more likely to complete a checkout if a business has a frictionless returns process. With the Temando Returns Module for Magento, you’re able to remove the friction from a historically poor customer experience and turn it into an aspect of your business that is not only functional, but can also add significant value to your business. This blog post is going to run through everything you need to know about the returns module to ensure you’re making the most out of it. *This blog post is an educational entry about the Temando Returns Module for Magento. This module is only available for customers on the Business plan. To find out more about returns and upgrading your subscription, contact our Solutions Team. It’s always important to know what your customers have to go through for any business process. Here is no different. The returns journey for a customer is very straightforward. If not logged in, a customer can click the ‘Orders and Returns’ link at the bottom of your website and search for the order manually using their order reference number. Once the customer has located their order, the process is the same. Now the customer needs to fill in a Return Request form. This outlines which items need to be returned, the quantities and the reason why. It also allows for additional comments if required. After the request has been submitted, the customer needs to await the approval of their request. Once approved, a courier will be booked to collect the item and the customer will receive an email with a consignment label to attach to the package. After the product has been returned and assessed the customer will receive the requested refund or exchange. 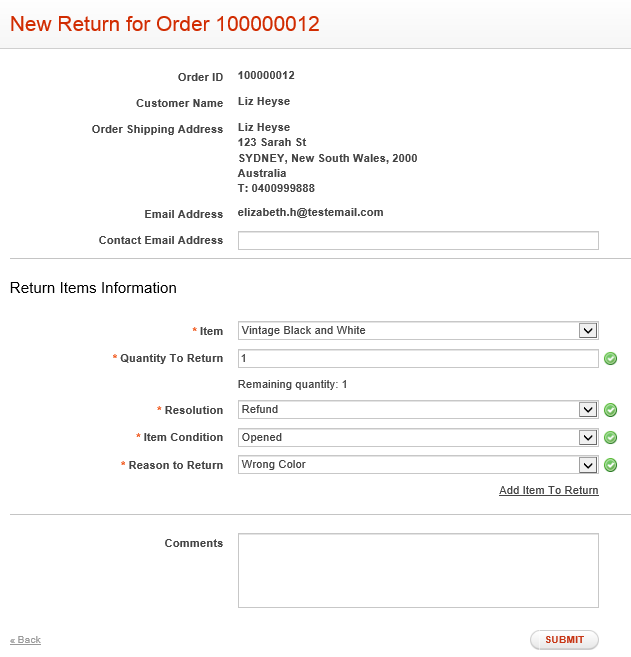 To process returns, log into your Magento dashboard and under Sales > RMA, select Manage RMA. Now you will be presented with a grid of return order requests. Click any of the orders to see more about the request. 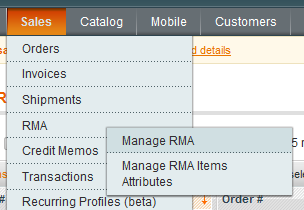 On the navigation bar on the right of the page, select ‘RMA Items’. This will display the item the customer wishes to return and the resolution that they are after. To decline the return, simply select ‘Decline’ from the status dropdown menu. To approve the order, enter the no. of ‘Requested Qty’ into the ‘Authorised Qty’ field and change the status dropdown to Approved. Then click save. Once saved, you will see a confirmation in green at the top of the page. In the Temando tab, enter the Manage Returns option. You should now see the order in this grid with the status ‘pending’. Clicking on the order will take you into the booking view, identical to the one you would see when managing shipments. The difference here is that the pick-up address should be listed as the customer address. At the bottom of the page you will be able to view quotes for the shipment and book your preferred option. Once booked, your customer will receive an email with the consignment label to attach to the item and to wait for the carrier to collect it. It’s that easy. Hopefully this post has been useful in demonstrating both the benefits and the practicality behind the Temando returns module. Enabling easy returns for your customers goes a long way to providing an excellent customer experience as it takes a process that is so often a nightmare and turns it into something that gives your customers confidence in your brand.